I can imagine this one (called the Sand Flea) being used by the military and police for sending in cameras and other spy equipment in an urban landscape. The Big Dog (below) is something I really could use when I am gardening – a container on its back, and a voice interface so I could tell it to go empty itself in the compost bin when it is full of garden refuse. This entry was posted in Amazing, Digital reflections, Nerdy ruminations and tagged robot on March 29, 2012 by Espen. War is not what it used to be. Both the implicit trends and explicit strategy has gone from large-army movements – the invasion of Iraq may be the last large-scale invasion we will see for quite a while – to smaller-unit conflict management and “surgical” actions, such as the raid on Osama bin Laden. This is partially a result of technological evolution (advanced weapons demand much training, making conscripted soldiers, who become civilians just as they have learned how to operate them), partially a change in warfare – more and more conflicts are asymmetric, with urban or rural guerillas facing a traditional military force, hiding among the civilians and forcing the regular army to either be ruthless or to win hearts and minds. In both cases, war is expensive for the decision-makers. Today’s young men do not have four brothers and face a career of back-breaking work on the family farm or in a factory or mine – prospects that might make a military career, however the peril, look interesting. With less than two children per woman being the average in European countries, parents (and to a certain extent society, through education) have way to much invested in each individual to squander them on unnecessary and unimportant actions. This might change: New weapons such as remote-controlled and even automatic drones with pilots sitting halfway around the world, out of harms way, means that the price for war (both in money and lives, of soldiers as well as innocent bystanders) has been significantly reduced. So far, this form of remote warfare has been an American forte, but the weapons are becoming available for smaller countries, first in NATO, then in other countries. I predict that Norway, for one, will scale back its very expensive and politically complicated purchase of advanced, manned F-35 fighters and instead see if more of their needs can be met with the cheaper drones – a disruptive innovation in more than one sense. This evolution is slightly worrying, for a number of reasons: First, the lower cost of war may make military solutions more tempting to politicians – bloodless or not. Second (and in the longer term more scary) automated weapons can, like all automatic systems, malfunction in unpredictable ways and you can even envision them turning against you, as has happened with anti-aircraft missiles. You really don’t want rogue drones with malicious intent out there, whether it is inserted by hackers or come about through unintended systems interactions. Third, the low price and standard components of the weapon systems may mean that they, in time, will be available not just to large nations, but also to the guerillas and terrorists they were invented to confront. Imagine a home-made drone with cheap technology as the new Kalashnikov – solid, simple and able to make up in numbers what it lacks in sophistication. I don’t know if remote weapons need a solid infrastructure of communications technology, in particular networks (satellites, cellphone networks, wi-fi) or if they can be controlled with direct radio transmission. 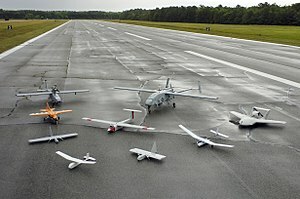 There is quite a lot of data that needs to go across, in close to real time – but given the falling cost and increasing range of of digital wireless communication, it is not too hard to imagine that these weapons could be cheap, perhaps even built from standard parts by insurgents themselves, both for spying and for weapons delivery. Small and cheap has a tendency to carry the day, and enemies learn from each other. Let’s just hope that Steven Pinker is right – and avoid thinking too much on the suppressive possibilities of autonomous weapon systems. This entry was posted in Nerdy ruminations, Strategic on March 26, 2012 by Espen. I actually like this version of the song better – even without the video. But they are both great. And there you have it – the beauty of art, evolving where people take what others have done and put their own spin on it. Brilliant. Incidentally, the reason I found these videos is entirely due to my youngest daughter. Just so you don’t think I have the first idea about music. Or anything else. This entry was posted in Nerdy ruminations on March 21, 2012 by Espen. On Friday and Saturday I had one of the most intense teaching experiences of my life – the Participant-Centered Learning seminar at the Harvard Business School. This two-day seminar, with about 50 students from more than 30 institutions, is an introduction into case teaching – but for the course leaders, it is an exercise in meta-thinking. 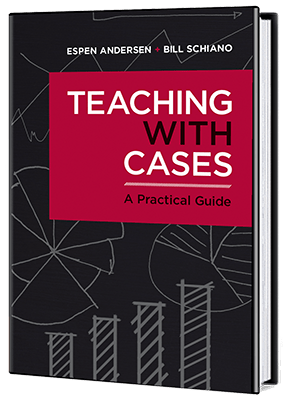 When you teach a case, you need monitor processes, in real time, on at least two levels: The case problem itself (and cases can be complicated, you need to know them well); and your own performance as a teacher – are you reaching your teaching objectives, and is the way you lead the discussion furthering them. Practice helps, but like with all things new, leading discussions takes a lot of thinking until it gradually becomes a habit and is done more by in central nervous system that the front cortex. At the end of the course, I felt as if I had just finished a long car drive in a car where the gears and pedals had been switched around, every direction decision and subsequent execution requiring copious amounts of conscious processing. Reputedly, the brain consumes 20-24% of the body’s energy, and I certainly felt that way when I got home, barely able to do anything more than sack out in front of the computer with a glass of good red wine and a few old Top Gear episodes. That being said, however, the whole experience was also extremely invigorating. The students were interested, energetic, and from admirably diverse backgrounds, from US elite institutions through low-cost regional online educators to universities in China, Turkey and Denmark. It was also interesting to have the full resources of a Harvard case classroom at my disposal – in particular, having ample blackboards (9, as a matter of fact,) old-fashioned but so much better in every way, including sightlines. Having a great room changes how you teach – though I will have learn how to exploit the room better, especially the boards, should there be a next time. But all in all, a most enjoyable experience. As I have previously written, I think good discussion teaching is a source of differentiation and competitive advantage for both teachers and institutions. I stand by that view, all the more so for my experience this weekend. This entry was posted in Teaching and tagged teachingwithcases on March 20, 2012 by Espen. One of the joys of living in Boston is the seafood, which is deliciously and not too expensively (at least by Norwegian standards) available lots of places. 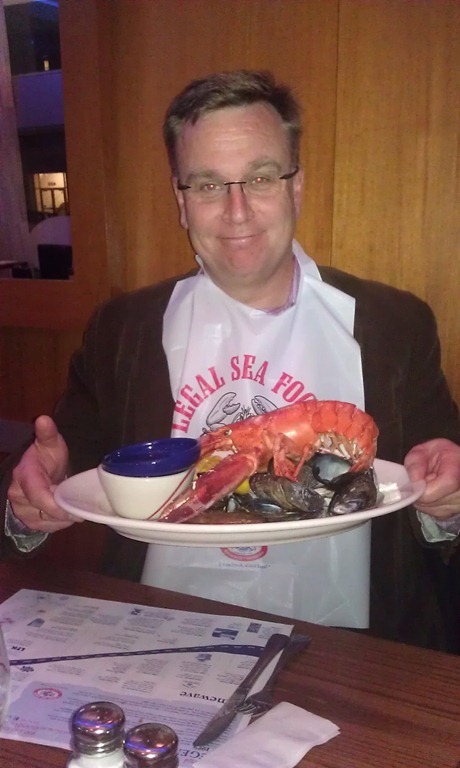 This picture is from today’s dinner with the MIT CISR team, shot by my eminent colleague Martin Mocker, and, I think, accurately conveys the splendor of the “lobster bake” and my appreciation of it. A “lobster bake” is a traditional New England lobster dinner with a delicious cup of “clam chowdah” as an appetizer and a plate of littlenecks, clams, chorizo (to give the sweet seafood a little contrast), corn on the cob and, of course, a medium-sized lobster. Note – Legal is no longer available at terminal C! Your best bet is probably to eat somewhere outside the airport… This picture is from the Legal Seafood in Kendall Square – but the most convenient location for lobster, for me at least, is the Legal Seafood restaurant in terminal C at Logan airport. Since the flights to Europe normally leave at 8-8:30 pm, my preferred way to fly is was to check in early, walk over to Terminal C, and feast on inexpensive seafood and decent local beer or a dry white wine. This frees you from the need to eat airline food and puts you in a calm and collected and rather sleepy frame of mind before taking off. This entry was posted in Itinerancy observations on March 14, 2012 by Espen.